We usually try to give you a pretty accurate listing of the produce in your box, but since the newsletter is published before the harvest, sometimes we may substitute some vegetables for others. If you’re having trouble identifying any unfamiliar produce, please look for “Veggie ID” with additional information on our website under CSA INFO or under RECIPES. ARUGULA: an aromatic, bright salad green with a peppery mustard flavor. See Week 1 newsletter for storage and usage information. CABBAGE: You will receive Gonzales (a sweetly spicy green mini cabbage with 4-6-inch heads) or Red Express (solid, round, 2-4 lb. red heads). See Week 2 newsletter for usage and storage information. CARROTS (Mokum): a very sweet, slender, “pencil carrot” with edible green leaves. Greens are delicious in soups and also salads. See Week 1 newsletter for storage and usage information. CELERIAC: also called Celery Root, rather ugly, knobby, brown vegetable skin with white flesh when peeled; taste is like a cross between strong celery and parsley; can range anywhere in size from an apple to a small cantaloupe; high in carbohydrates, vitamin C, phosphorus, and potassium. How to store: refrigerate in plastic bag for up to a month; may also be dried and used as a seasoning. EGGPLANT: You will receive Nadia (slender, purplish-black, glossy-like, bell-shaped fruit), Rosa Biana (an Italian heirloom; round fruit streaked with white and violet), or Orient Express (long, lavender fruit). How to use: may be salted to remove bitterness from old fruit, but also makes it less watery and more absorbent, and can greatly enhance the taste and texture of your dish; can be baked, boiled, fried, grilled, or can be sliced into rounds for grilling or broiling, and cut into cubes for stews and stir-fries. How to store: best fresh, but can be stored at room temperature or in refrigerator drawer for up to 1 week. GARLIC: a bulb of several papery white cloves. See Week 1 newsletter for usage and storage information. POBLANO CHILI PEPPERS: known as “poblanos” when black-green, but becomes an “ancho” when brick-red and fully dry; popular in Southwestern recipes; heart-shaped fruit, which is mildly pungent with a lightly sweet, medium-hot flavor). How to use: often roasted, chopped, and used to season corn bread and cheese dishes; good for stuffed appetizers, jams, & salsa. How to store: For fresh peppers, store in refrigerator. For drying peppers, place string through the stems and hang in cool, dry, well-ventilated spot. SWEET BELL PEPPERS: You will receive Sweet Sunrise Bell (medium-large, blocky, yellow-orange pepper; fruity, sweet flavor) or Red Knight Bell (big, blocky, thick-walled, green-to-red pepper with sweet flesh). See Week 1 newsletter for storage and usage information. POTATOES: You will receive German Butterball (a round to oblong tuber with lightly netted golden skin that wraps around deep yellow flesh. Slightly mealy, this is good for everything – frying, baking, mashing, soups) and All Blue (an heirloom potato with deep blue skin and flesh; moist texture; perfect in salads, baked, or boiled) and French Red Fingerlings (dark rose-red skin and yellow flesh; creamy taste and firm texture, excellent roasted or boiled.). See Week 1 newsletter for storage information. PIE PUMPKIN: bright orange skin with dry, sweet flesh. Please take 1 pumpkin if you do NOT split a share, and 2 pumpkins if you do split a share. DAIKON RADISH: looks like an overgrown white carrot, but with a slightly mild radish taste. Lots of recipes on the internet. -How to use: eaten fresh, cooked, or pickled; greens are also edible and can be used like any tender green. RADISHES (Pink Beauty): pink-colored root with mild, spicy flavor. How to use: raw, roasted, used in soups, sliced in salads, sandwiches, or stir-fries, grated in slaws; Radish greens (excellent source of vitamins A, C, and the B’s) delicious in soups or stir-fries. SALAD MIX: You will receive a bag of mixed salad greens—baby tatsoi, baby mizuna, and baby green and red leaf lettuces. How to store: remove greens from turnip root and store separately in plastic bag in refrigerator for up to 3 days; roots can last up to 1-2 weeks in refrigerator. SWISS CHARD: close relative of garden beets; very small, multi-colored, large veined, semi-crinkly, dark green leaves; mild flavor. How to use: greens can be prepared like spinach or beet greens; good steamed, sautéed, stir-fried, and in soups. How to store: wrap in damp cloth in a plastic bag and refrigerate for up to 2-4 days. WINTER SQUASH: You will receive all of the following: Black Forest Kabocha (smaller size kabocha; dark green, flat-round fruits; buttercup size with no button on end; orange flesh is medium-dry & sweet), Butternut (light, tan-colored skin; small seed cavities with thick, cylindrical necks; bright orange, moist, sweet flesh), and Heart of Gold (a sweet dumpling hybrid acorn squash; outer skin is cream colored with dark green stripes covering a fine-grained inner flesh that is orange when ripe; sweet rich flavor and can be baked, mashed or steamed). See Week 1 newsletter for usage and storage information. 1. LAST DISTRIBUTION THIS WEEK! Please return any forgotten boxes from past weeks, since this is the final week of the Extended Fall Share. You may bring bags, a cooler or other containers to transfer your produce from the boxes at your Distribution Site. We also can use any EXTRA PAPER OR PLASTIC BAGS (Grocery Bags ONLY) that you have to donate. 2. THANKSGIVING SHARE AVAILABLE! 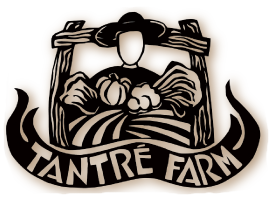 We still have room for more members to pick up a $110 share on Nov. 23 at the Ann Arbor Farmers’ Market from 7 A.M. until noon or at Tantré Farm from 2-5 P.M. Please request a form at Distribution Sites or call or e-mail us. Full payment needed by Nov. 10 for you to be registered. Non-CSA members are welcome to register. 3. INTERESTED IN JOINING OUR CSA IN 2014? Shares for current members and non members will be available for $625 in all locations from June through the middle of October. We will be accepting $100 deposits ($25 of that deposit is nonrefundable if you choose to cancel your share) to reserve your share for 2014 starting now. Please ask for a registration form at the pick up sites if needed, or it can be sent online and through the mail. Moment by moment, hour by hour, day by day, the pieces of the farm are harvested and distributed to many homes or put away for the winter. Cabbages, potatoes, winter squash and radishes are put into crates and bins–one at a time. From the place where they rest after they ripen or fatten, either on top of the soil or underneath, to the container that holds them. One by one, row by row, patch by patch, field by field, many hands aid the migration of all that has been growing for the past summer and fall. Each leaf, each berry, each carrot, each potato has been touched by many hands and many cosmic and terrestrial phenomena—the sun rays, the star shine, the moon shadows, the air, the wind, the rain, a myriad of microflora that inhabit the soil. Each infinitely divisible moment that is embodied and gives rise to each and every vegetable, piece by piece, leaves us in awe of this great cosmic mystery and vibration, which we call our home. If we live our lives with the greatest intentions, it is for the embrace of this moment to find what is authentic in our lives. Those intimate and intricate epiphanies and insights that come from looking deeply into our hearts and minds and speaking clearly about how all things are connected and ever changing. As all these pieces connect and grow together, it’s from these that we gain understanding of the inarticulate tones that resonate within our hearts. The mystical visions and cosmic vibrations of infinite and eternal energy can be heard in the whispering wind of a bat’s wing over the barnyard at dusk. Each piece of everything comprises the whole, one by one. We have a crew of individuals, who make up the whole of our farm, searching for moments of authenticity. Maybe this can be found in the hands of the very many dedicated persons that inhabit Tantre Farm. Each person who has touched this land and this produce has been a great and bountiful gift to us in so many ways. Finding so many good-hearted people to work together to create and share the harvest has been a good thing. We would like to acknowledge each person, who has helped with the farm this year as we celebrate the close of our summer and fall seasons. We look forward to the winter season to distribute one of the most abundant harvests ever seen on the farm. Please feel free to contact us throughout the rest of fall and winter for more of these storage crops or come visit us at the Ann Arbor Farmers Market. Thank you for helping us continue to embrace these moments on the farm. COOL & CRUNCHY RADISH AND TURNIP SALAD (adapted from “Eggs on Sunday”) Serves 2. CELERIAC POTATO GREEN CHILI SOUP (from Asparagus to Zucchini: A Guide to Farm-Fresh, Season Produce, MACSAC) Serves 4. Sauté onions in butter or oil until completely cooked, about 15 minutes. Add celeriac and thyme; cook stirring frequently, 5 to 10 minutes. Add potatoes, milk, and peppers, simmer until potatoes and celeriac are cooked through. Blend smooth in food processor. Season with salt, pepper, sugar, and rice wine vinegar. Break the banana into chunks, and place in blender or food processor with remaining ingredients. Blend until creamy-smooth. Taste and adjust spices. Pour into cups. If you like, let it firm up in the freezer for 1/2-1 hour.